Dr. Christine Townend is the founding trustee of Darjeeling Goodwill Animal Shelter, a registered Indian Charitable Trust. She founded DGAS in 1998 with the help of Jaipur Lawyer, Mr. G.K. Tiwari. Previous to this, she had served as Managing Trustee of Help in Suffering Animal Shelter, based in Jaipur Rajasthan, in a voluntary capacity from 1990-2006. Her husband, Jeremy, a lawyer, worked with her also in a voluntary capacity. 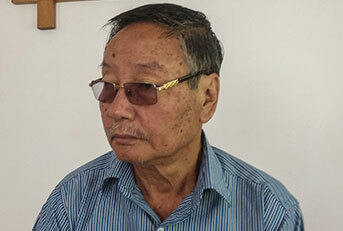 During this time with the help of Mr. D. R. Mehta and Mrs. Timmie Kumar, all killing of street dogs was halted by the Jaipur Municipality and HIS introduced an Animal Birth Control (ABC) programme which Christine then started in Kalimpong and Darjeeling with the support of the Chairs of the Municipalities. The Hidden Master, Motilal Banarsidass, Delhi, 2002. 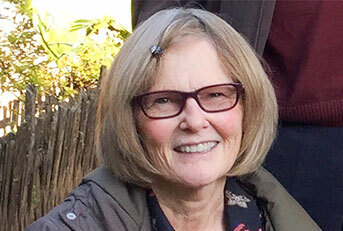 Additionally a biography about her work in India, Christine’s Ark, was published by journalist John Little by Macmillan in 2006, and a memoir about Christine’s work in India was published by Sydney University Press in 2017. Addl. Secretary, Ministry of Finance, Government of India. Chairman Security & Exchange Board of India (SEBI). Mr. Mehta is the Founder and Chief Patron of Bhagwan Mahaveer Viklang Sahayata Samiti (BMVSS), Jaipur, the parent body of Jaipur Foot. Under his leadership, BMVSS has by now rehabilitated 1.71 million amputees, polio patients and etc making it the world’s largest organization for the disabled. Mr. Mehta is an ardent animal activist also. 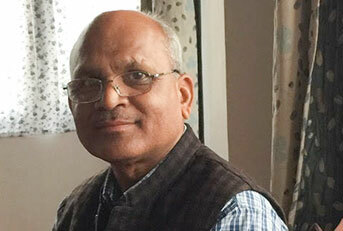 Padma Bhushan (one of the top most civil awards in India)– from the President of India in 2008 for his social services. Rajiv Gandhi National Sadhbhavna Award – 2012 from the Prime Minister of India, for his social services. TECH Museum Award for Innovation and its use for Humanity in the USA in 2007. Mr. Mehta was born 25th June 1937. 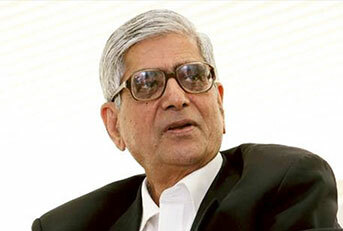 He is a Bachelor of Arts and Law from Rajasthan University, Jaipur, India. He is also an alumnus of Royal Institute of Public Administration, London and Alfred Sloan School of Management, MIT – USA. Timmie Kumar graduated from J.J. school of arts- Mumbai with specialization in Interior designing- 1979. She loves Art in any form and had own painting exhibition in New Delhi and promoted lot of young artists. She is very passionate about animals since childhood and was a Founder member and a Trustee of “Animal Lover’s Association” NGO in Agra where she lived and worked for the welfare of animals for 10 years before moving to Jaipur. “Animal Lover’s Association” NGO protested for banning performing animals like monkeys, snakes, bears etc. and also did rescue of injured and sick animals. She was also a Founder member of “Kennel Club” of Agra in 1996. She started working with “Help in Suffering”- HIS animal NGO in Jaipur as a volunteer 17 years back and took over as a Managing Trustee of HIS in 2002, First Indian Lady as a Managing Trustee of HIS. She started HIS product merchandise to raise funds for animals at HIS which is expanding day by day. She resigned from the post of Managing Trustee of HIS in July 2017, but continues to support HIS as Chairperson of the organization. She received an award for Pride of Jaipur in 2012 and an award by Nexzen for excellence in social work. She also an active supporterof child welfare organizations like “Faith” “Disha” and “Umang”. She also participated in a protest against Captive elephant’s cruelty in Jaipur at Amer. HIS worked with Government to regularize elephant trips in Amer, to stop the use Ankush, shade for elephants and training of Mahout with experts from Burma, Kerala and England. 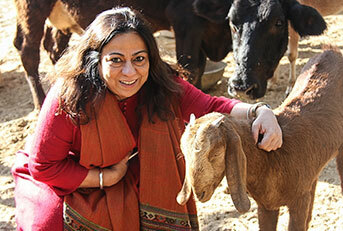 She continues to help other young volunteers in Jaipur who are working for animals’ protection. Trustee – Darjeeling Goodwill Animal Shelter, Kalimpong & Darjeeling. Rtd. Teacher-In-Charge Southfield College, Darjeeling. 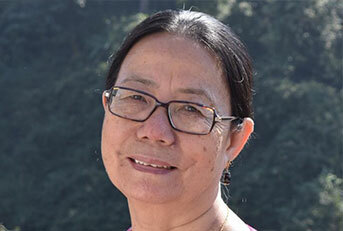 President of Himalayan Buddhist Cultural Women Association Darjeeling. Member of College Service Commission, Govt. of W.B. Life member Red Cross Society Darjeeling. Author of Many Journals and Periodicals. Court member of university of North Bengal for many years. Elder of Bom Self- Supporting Church, Kalimpong.